It is time again for Garden Bloggers Foliage Day (GBFD), hosted by Christina at Garden of the Hesperides. Near the back steps, a passalong dahlia is preparing for its second year in my garden, courtesy of Libby at An Eye For Detail. The foliage looks strong and flowers are forming. I neglected to dig the dahlia last fall so am relieved to see it made it through the winter. 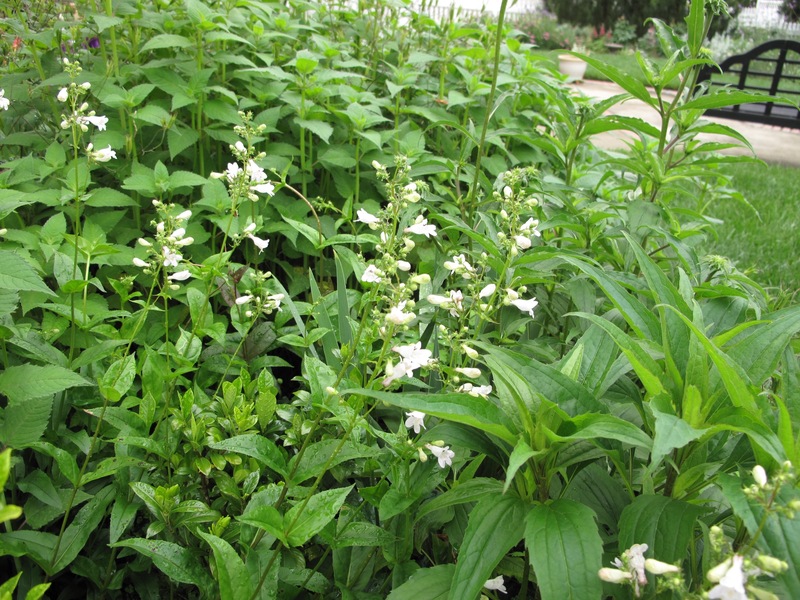 In the upper left of the image above, fragrant Monarda didyma (Scarlet Beebalm) is inconveniently growing up through where the garden hose is stored and needs to be reined back. In front of the monarda, a few dark red leaves of Penstemon digitalis ‘Husker Red’ (Beardtongue) are visible. Also here several plants of Echinacea purpurea (Purple Coneflower) are pushing upwards through some impertinent clover and a ground cover of Iberis sempervirens (Candytuft). 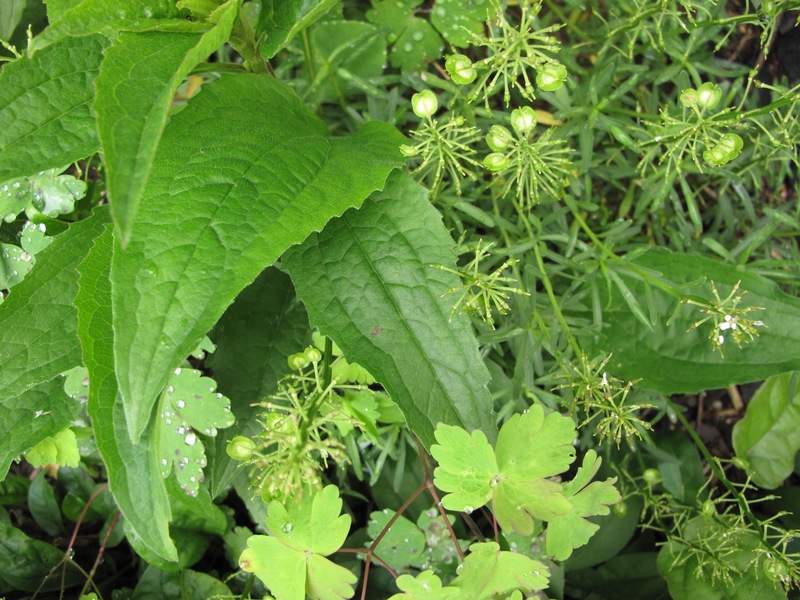 Foliage of Aquilegia canadensis (Eastern red columbine) peek through as well. The Aquilegia’s last remaining red flowers nod their heads. Here is a closer look at the Echinacea and Aquilegia, with seeds formed on Iberis. The textures were not planned but do look interesting together. The other side of the steps features a long, sunny border fronted largely by Leucanthemum x superbum (Shasta Daisy). 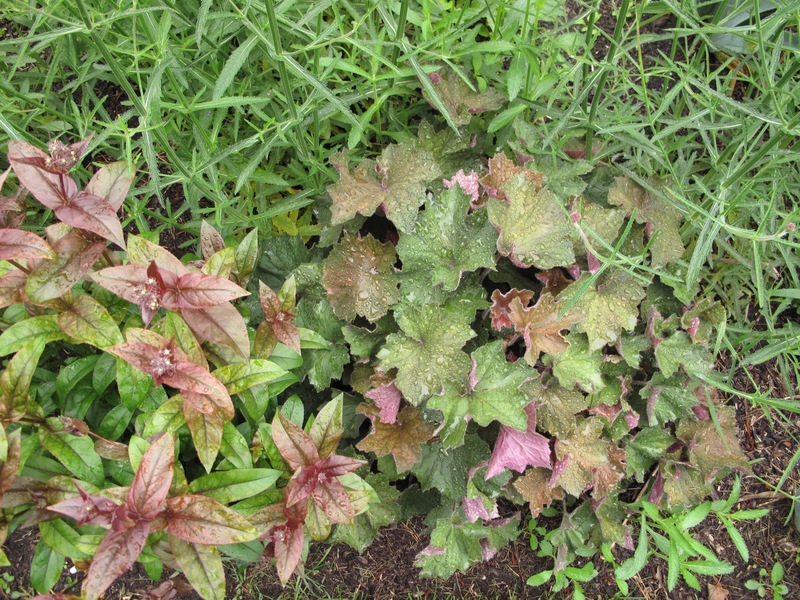 Across the garden in its shadiest corner, several Heuchera villosa ‘Big Top Bronze’ (Coral Bells) responded well to the recent rains and have grown substantially. Their multi-hued foliage is rich and full for the moment. Meanwhile Brunnera macrophylla ‘Silver Heart’ (False Forget-Me-Not) finished blooming, but the smaller silvery, patterned leaves add a bright pop to this planting area (lower left of image). 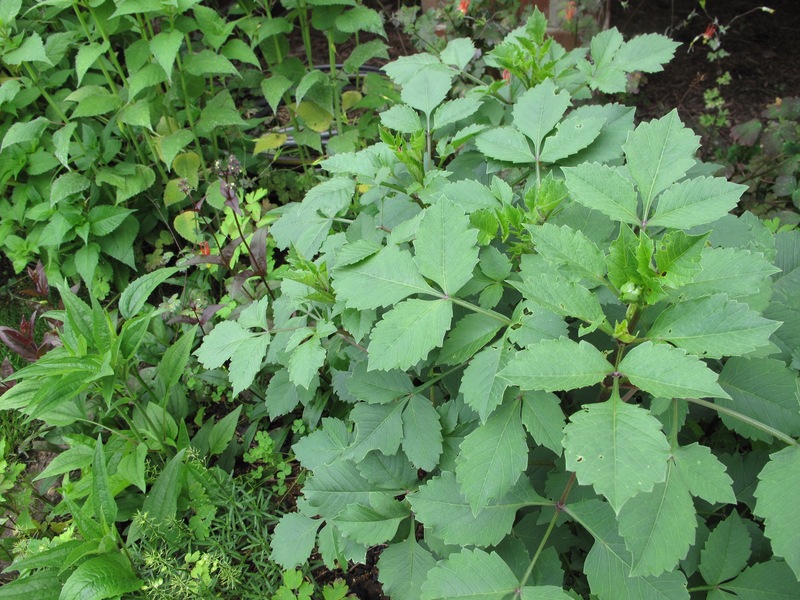 In back at left fern-like foliage of Tanacetum vulgare (Tansy) and sword-like iris leaves add height and texture. 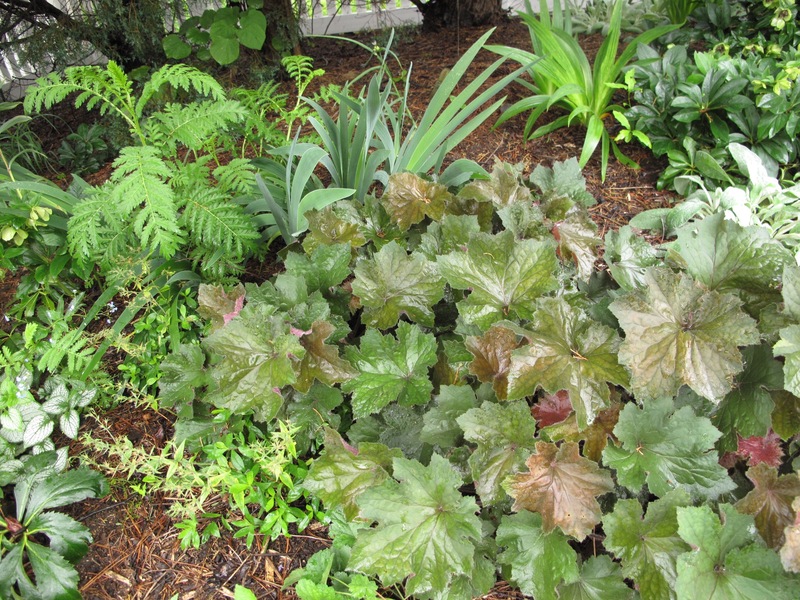 In a small nearby border with a bit more sun grows more Heuchera villosa ‘Big Top Bronze’. Its companion Penstemon digitalis ‘Husker Red’ has similar coloring. A stand of self-seeded Verbena bonariensis (Tall Verbena) with long green, leathery leaves gives a change in texture and color. 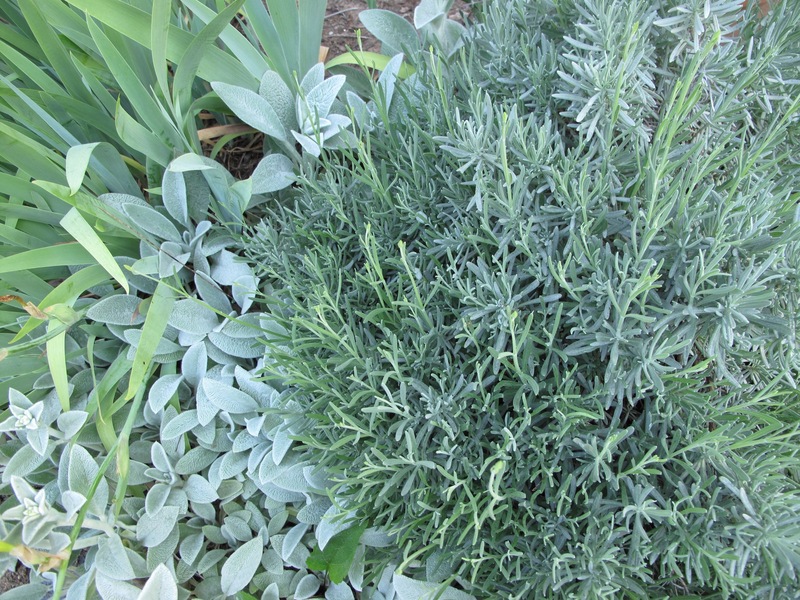 Silvery shades of Stachys byzantina (Lamb’s Ear) and soon to bloom Lavender complement more leaves of Bearded Iris. 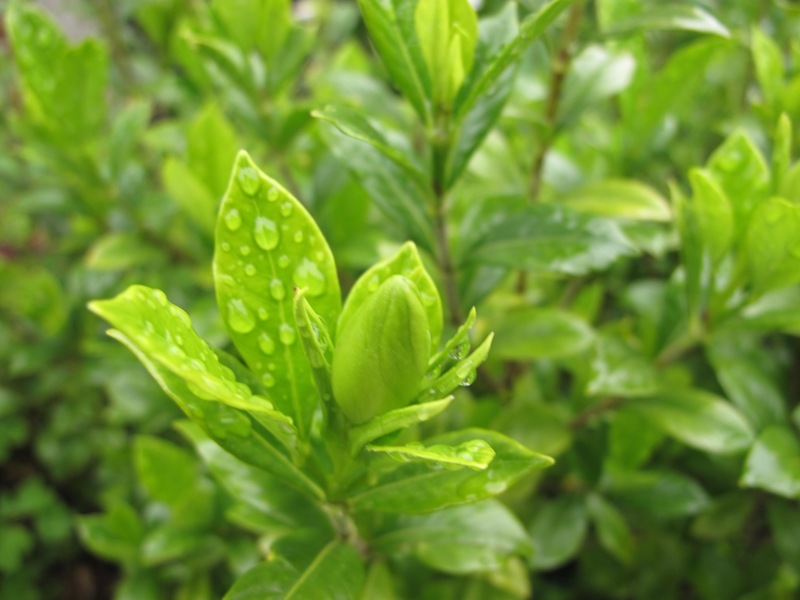 Four Gardenia jasminoides ‘August Beauty’ have been planted for about three years. Most are finally getting some size and buds are forming. 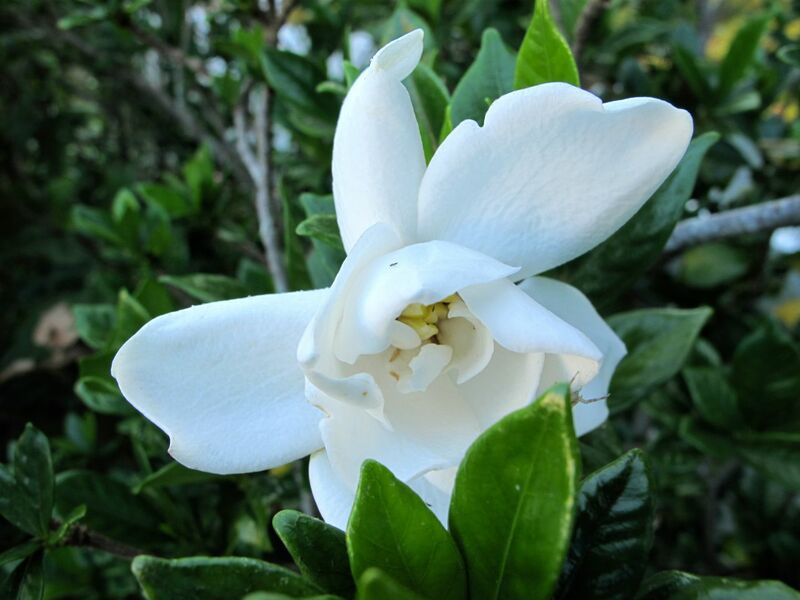 One of the August Beauty gardenias has been eclipsed by its aggressive neighbors. Soon the monarda will explode with red, inviting hummingbirds to sip its nectar, and dark pink flowers will grace the echinacea. 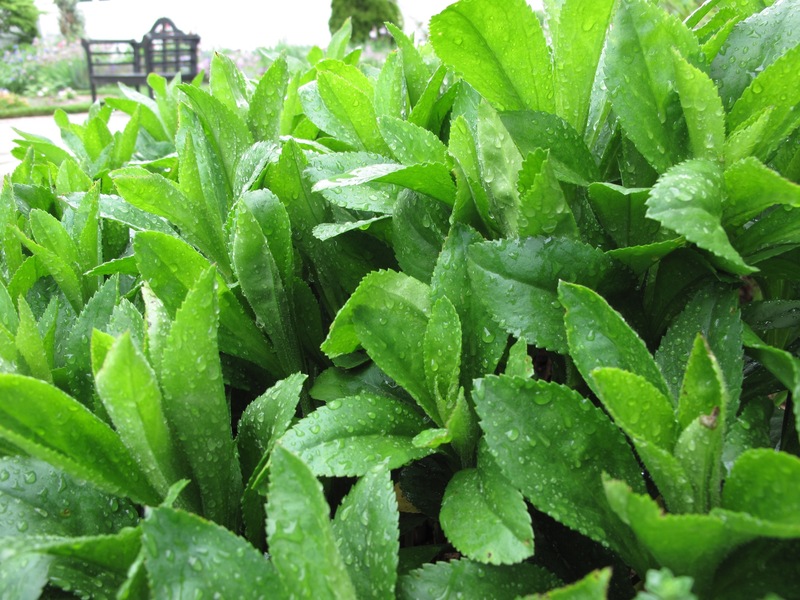 But for now this spot is a relaxing green with Penstemon digitalis ‘Husker Red’ providing white accents—a cool, calm, peaceful interlude. One Gardenia jasminoides ‘August Beauty’ has become swamped by surrounding plants. Thanks to Christina at Garden of the Hesperides for hosting. Read her foliage update and see more links to foliage perspectives from many parts of the world. This entry was posted in garden and tagged August Beauty, Bearded Iris, dahlia sp., echinacea purpurea, Garden Bloggers Foliage Day, GBFD, Heuchera villosa 'Big Top Bronze' (Coral Bells), late spring garden, Leucanthemum x superbum (Shasta Daisy), Penstemon digitalis 'Husker Red' (Beardtongue) on May 22, 2016 by pbmgarden. 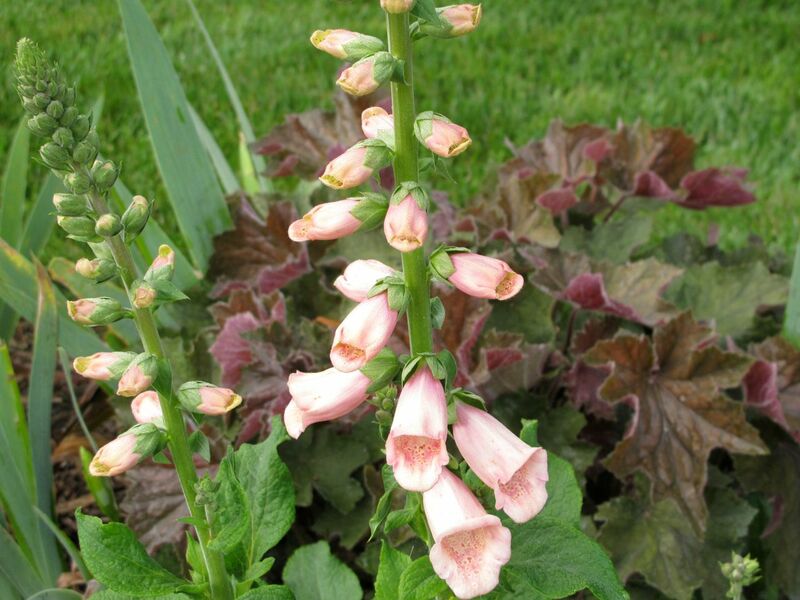 This entry was posted in garden and tagged Digitalis purpurea ‘Dalmation Peach’, Heuchera villosa 'Big Top Bronze' (Coral Bells), wordless wednesday on April 29, 2015 by pbmgarden. 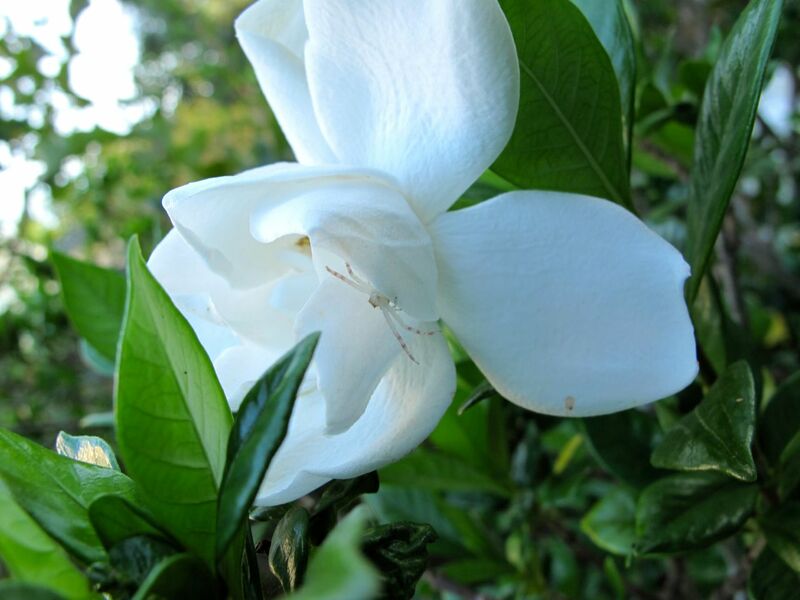 Gardenia jasminoides ‘Chuck Hayes’ fell victim to the cold winter and did not bloom in spring. Most of the shrubs have recovered now and offer occasional flowers. Two weeks ago I cut several for a Monday vase. I ended up not using them as the flowers were too far past their prime, but I enjoyed their sweet fragrance for several days. This evening I spied a fresh bloom, apparently home to a little translucent, white spider. This may be a crab spider or a ghost spider. 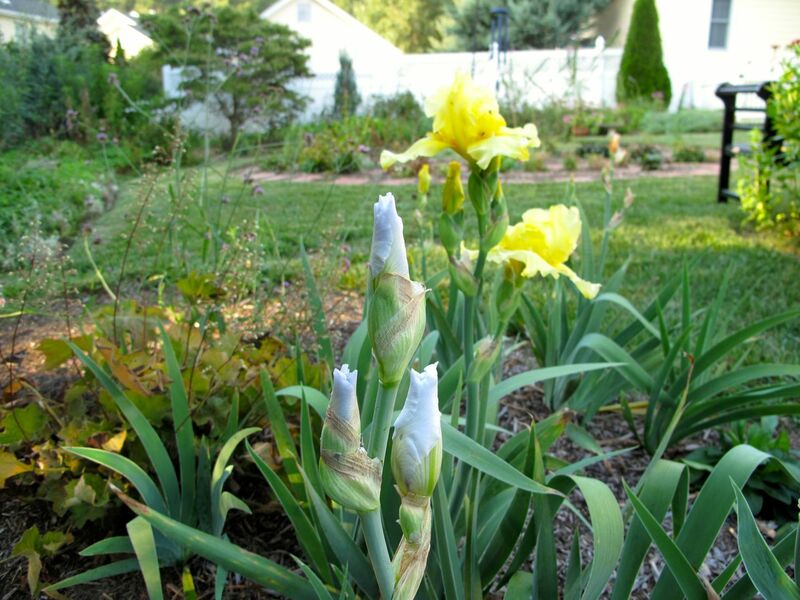 More of the yellow reblooming bearded German Iris have opened this week and the white Iris germanica ‘Immortality’ will soon follow. On the left beside the irises a Heuchera villosa ‘Big Top Bronze’ (Coral Bells) has been blooming for several weeks. Although the plant tag indicated this cultivar could tolerate full sun, even planted here in part sun its leaves have brown edges, crisped by the hot summer rays. 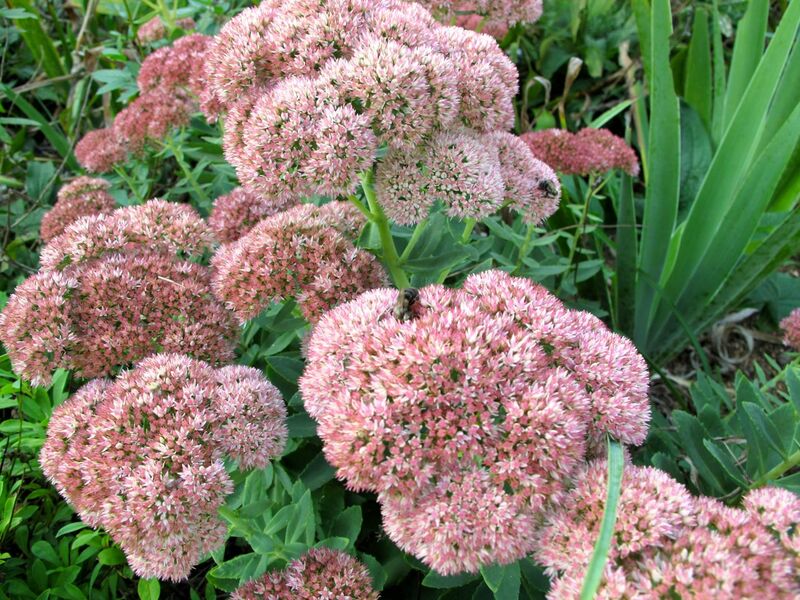 Autumn Joy sedum is fully open in front of the northern border. Several bees and a wasp were feeding on it. 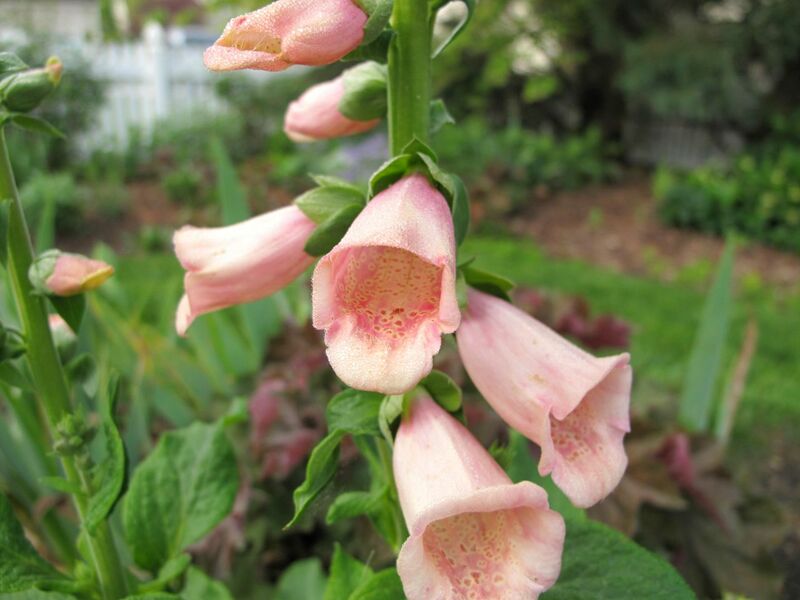 This group of plants have a dusky rose color, while nearby some purchased a year earlier have a flatter top and brighter pink hue. This entry was posted in garden and tagged Gardenia jasminoides 'Chuck Hayes', Heuchera villosa 'Big Top Bronze' (Coral Bells), Hylotelephium telephium 'Herbstfreude' (Autumn Joy), Iris germanica, reblooming iris on September 11, 2014 by pbmgarden.